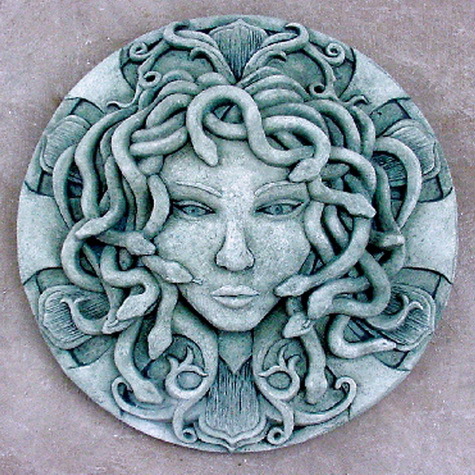 Medusa – "Fine sculpture for every environment"
Most people are familiar with the Greek story of Medusa. But actually, Medusa was the serpent goddess of the Libyan Amazons whose name means “Wisdom” (Sanskrit – Medha, Greek – Metis, Egyptian – Met). She represented the destroyer aspect of the triple goddess, or the goddess of death. Ancient inscriptions on her temples say “No mortal yet has been able to lift the veil that covers me. Look upon my face and be turned to stone.” Literally, to die and be commemorated as a funerary statue. The Perseus story was invented to account for the appearance of Medusa’s face on Athenian temples (which were inherited from the pre-Hellenistic period when Medusa was worshiped there).